It’s difficult to know who is going to suffer most from the Comic Relief meeting of Prime Minister David Cameron and beaming pop-muppets One Direction. On the one had we have a lightweight PM confirming that he is no more than an unimaginative PR man promoted way above his competence level. On the other we have a blandly mainstream boy band willing to associate their brand name with anyone or anything for the sake of publicity. No, actually, we now know who is going to suffer the most. It’s all of us who have to watch this kind of excruciating pop and politics mash-up that is tolerated simply because it is for charity. 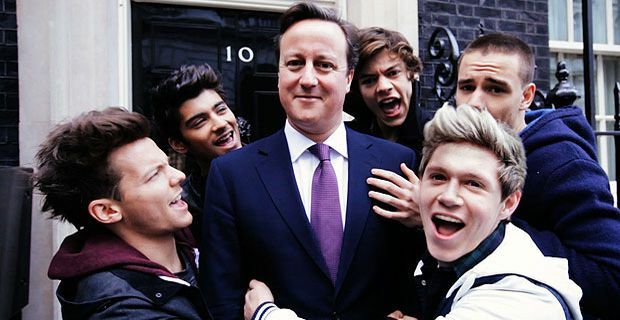 Cameron makes a cameo appearance in One Direction’s video for their Comic Relief single. They have chosen a medley of Blondie's One Way or Another and the Undertones' Teenage Kicks, continuing their policy of ripping off classic 70s bands for their tunes. Part of the video was recorded in Downing Street and Cameron seized the chance to bring his beaming presence to the nation’s youth. One Direction fans are too young to vote, Dave, one of your advisers should have told you that. In theory the Prime Minister earned his part in the Comic Relief grin-a-thon by dint of the Government’s generous decision to exempt the charity single from VAT. To be fair, Cameron is merely following a precedent of previous PMs adding their uneasy presence to the annual charity event. Tony Blair was even rather convincing delivering Catherine Tate’s catchphrase "Am I bovvered?" in a sketch with the comedian, perhaps because it summed up his attitude to critics during his decade in office. Gordon Brown went way beyond the call of duty by agreeing to appear in a sketch with JLS and James Corden after he had been voted out at the 2010 election. Perhaps next year we could just be asked much we will donate if the Prime Minister can agree to stay away from Comic Relief completely.